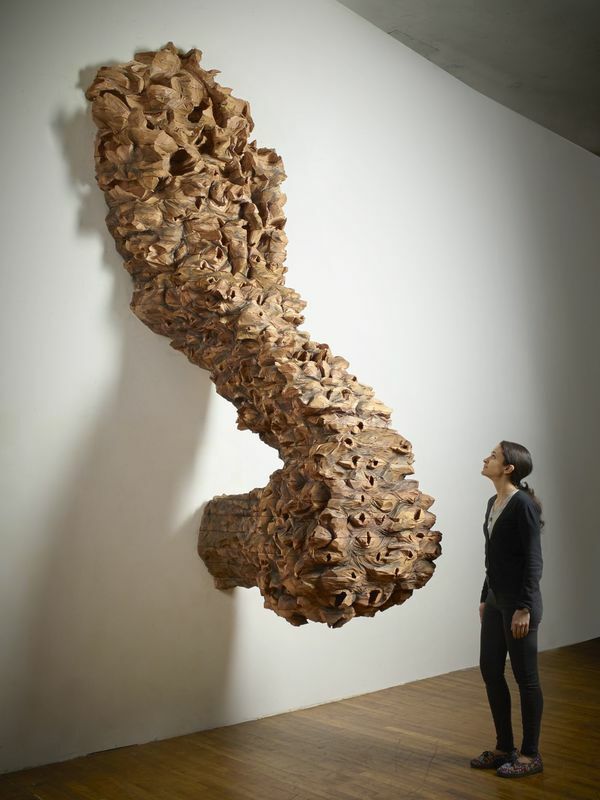 Ursula von Rydingsvard's new, fierce, undulating sculptures take on a courageous vulnerability in these towering works (and a few smaller ones) in cedar, bronze, paper, and resin. The cedar works are carved, sliced, bruised, and then re-constructed into ferocious pieces that haunt with fragility. In Nester (2016), eleven feet high, the wood inherently recalls the landscape. Yet its formation conjures up a caterpillar's measured crawl or an animal's tail raised in fright. The gaping holes utter silent chatter, as the rhythmic motion of the carved details relieve the overpowering mass. The majestic, tree-like bronze of Z Boku (2017), with its lacy tendrils, appears to timidly reach for the sky, projecting strength and tenderness in equal measure. Burrows begin tentatively at the top of Oziksien (2016), while becoming larger and seemingly louder as they plummet downward, reaching an all-out crescendo at the floor. It offers reverence to nature's power.